Lead guide Nacho Espinosa: Nacho is a fully pinned IFMGA/UIAGM guide from Ecuador. He has guided dozens of high altitude technical peaks around the world and knows Alpamayo well. Nacho adds a wealth of authentic Andean experience to the trip. When he’s not exploring the mountains, Nacho plays base guitar in a local punk band. Assistant Guide Ray Hughes: “Headed South for the Winter!” jokes assistant guide Ray Hughes. Ray is one of our core guides for our local Tahoe program. Although Ray was born and raised in Northern California, he’s made a place for himself in Colorado, Western Canada, Iceland, and the European Alps. In the coming weeks, he’ll find himself at home in the Peruvian Alps. Ray is an AMGA Certified Ski and Alpine Guide, an AIARE Avalanche Course Leader and an American Avalanche Association professional member. Team had a great acclimatization hike today to 14,711′. 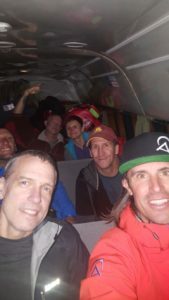 The whole team has arrived In Huaraz and they are getting psyched to begin their climb. Today the team took a day-trip out of the city to get their legs working at altitude for the first time. Their acclimatization hike brought them up to 14,711’/4485m today. 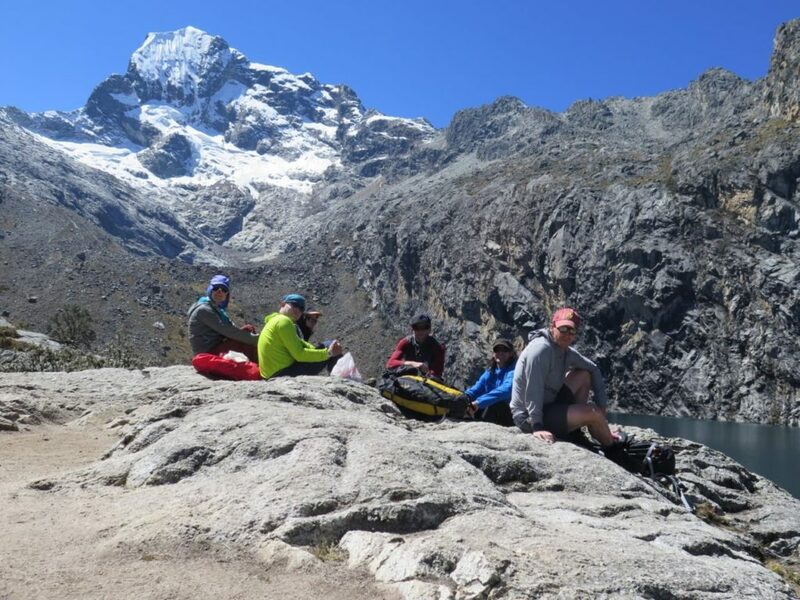 They stopped to enjoy a lunch break at the beautiful Laguna Churup. The team travels 3 hours north to the village of Cashapampa (9,000 feet/2,743 meters), the jump-off point for the climb. The drive will take them through beautiful farming communities as they head between the spines of the Cordillera Negra and the Cordillera Blanca. From there, they’ll organize burros with their gear and begin the hike to Llama Corral (11,500 feet/3,505 meters), where they will camp for the night. Anticipation is building as we get closer to starting the climb. 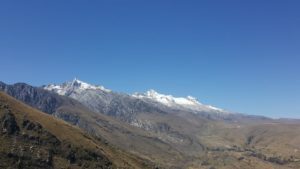 Alpamayo has often been nominated by climbers, magazines, and trekkers as “the most beautiful mountain in the world” and we’re eagerly standing by for updates from the team. Be sure to check back here for more photos and news at alpenglowexpeditions.com/blog.